Central Whitstable - Elevated Sea Views in Newly Refurbished Flat. A newly refurbished one bedroom flat that is very private and set on the top floor of a three storey period Victorian house. This elevated position enjoys a generous amount of sea views across Whitstable's coastine where there is always something to watch. From one man sailing boats to the local lobster boat dropping its pots off shore or simply watch the large sunset in front of you. There is a good sized bedroom with a large amount of wardrobe and drawer space for you to settle into, as well as a comfy armchair and newly laid carpet and rug. The room is bright and thoughtfully fitted out. The light fittings and carefully chosen art all fit in, as does the barnacle speckled driftwood coat hook by the door. Traditional wrought metal column radiators complete the look. The kitchen and dining area are very bright and airy with 2 traditional sash windows facing directly towards the coast. The kitchen is simple but well equipped for everything you are likely to need during your stay. There are the usual utensils and cutlery items as well as a Tassimo coffee machine, which is fee to use. We have chilled wine and Whitstable Ale stocked in our fridge for you to have during your break. So, you can just turn up and start to unwind the minute you get through the door. The lounge area, only separated by an oak, chocolate coloured, island worktop leads nicely from the kitchen where we have placed a few different styles of seats. Take your pick, we have a captain's chair next to the large sash window, a large comfy armchair or the sofa bed just the other side of the oak coffee table. The Karndean floor runs throughout the area and joins with the hallway. Here you will find board games, assorted reference books and local leaflets and maps. We've even stocked a few disposable BBQ packs for you to take to the beach and have an alternative meal if you wish! Finally the shower room is clean and modern in its design and fully tiled to give a luxury feel. We have equipped it with an easy to use chrome shower mixer and large rain head. There's a towel radiator and concealed toilet cistern area. The lights come on and off automatically as you use the room and the mirror cabinet has a sensor switch as well as a shaver socket. Fresh hand towels and mats are supplied at the start of your visit. This is just the beginning. You'll need to visit The Lookout to discover for yourself why other people have found this a special find! If you like waking up and having a sea view from your window first thing in the morning, then you'll love staying here. Watch the lobster boat drop its baskets, sailing boats drift past or sunset later after a good walk. The property is the perfect place to watch the world go by and people watch. We have provided a selection of chilled drinks for you to enjoy on your arrival while you unpack & unwind. We have a choice of wines, Prosecco, Whitstable ales and soft drinks for you to choose from. We have an honesty box policy for the enjoyment of this facility. A dishwasher is here for you to fill as you go during your stay. We just ask you to run it before you leave for the cleaner to empty. There is a large fridge for you to use. We also have this stocked with chilled drinks for you to use during your stay, operated on an honesty box basis. Electric oven unit below the worktop. An easy to operate microwave is ready to use. Very enjoyable couple of days . Comfortable , clean & extremely well equipped flat . 10 minute walk to high street , sea front . We were in town for a wedding just for a weekend. This location was great. It was right across for the Wharf which had all kinds of activity on Saturday that was fun. It was also about a block or 2 from the main little downtown. We even had a view from the den and kitchen. It gave us all the space we needed and conveniences. The kitchen had everything we would need. It was also quiet when we went to bed. The only thing was it was on the third floor so be prepared to carry your bags up to the third floor, We would definitely stay here again. Clean, well maintained, enough space, nice TV, kitchen items and tea! Really comfortable flat overlooking the sea and lively harbour. Newly refurbished, they have made use of all space available and it's great for one or two to enjoy a sea break. Easy walking distance from beach and town, we even managed to get a parking space right outside! The owners have included all the little touches that make your stay easy - a box of cooking oil / vinegar / sauce, tea and coffee, drinks in the fridge on an honesty system and enough loo paper! 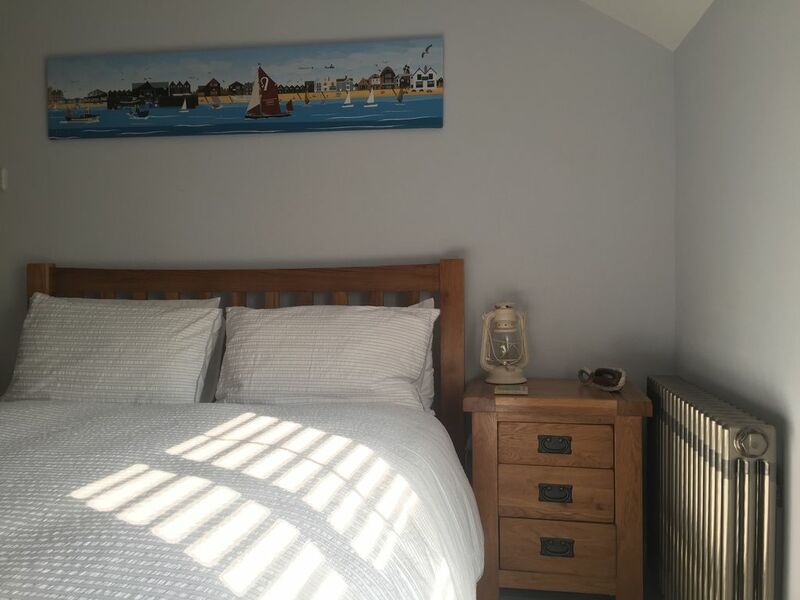 We needed a base for visiting our family who live in Whitstable and this well appointed flat ticked the boxes in terms of location, facilities and value for money. I'm guessing parking in the height of the season and at the weekends might be an issue but we went in mid July and experienced no difficulties and parked in the road around the corner on a couple of occasions and then in the public car park which is almost next door as well. I do agree with other comments that the kerb appeal isn't great and we found the location of the key box very low and awkward but these are minor inconveniences. The flat itself is clean, fresh, comfortable and quiet and well stocked. We have known Whitstable for many years and seen it blossom into the charming destination it is today. This flat is well located and means that you can walk to everything the town and the seafront has to offer in moments. Paul's communications were excellent throughout and we hope to stay again. I spent the weekend here as a birthday get away and was impressed with the effort that was put into the property. It was beautifully clean and had plenty of facilities to get me through the weekend (including a hairdryer, which I had forgotten to bring!) The location is fantastic, being a short walk from the harbour and whitstable beach, where I spent the weekend discovering I had been eating oysters completely wrong! A fantastic weekend and I certainly would revisit.